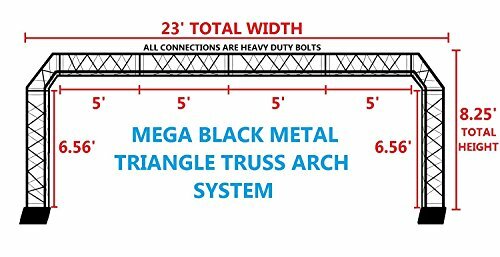 BLACK TRUSS ARCH KIT 23FT Width Mobile Portable DJ Lighting System Metal Bolts. LARGEST ARCH SYSTEM AVAILABLE! QUICK/EASY SETUP! Blowout Sale! Save 58% on the BLACK TRUSS ARCH KIT 23FT Width Mobile Portable DJ Lighting System Metal Bolts. LARGEST ARCH SYSTEM AVAILABLE! QUICK/EASY SETUP! by Cedarslink at IGWT. MPN: 23' ARCH SYSTEM. Hurry! Limited time offer. Offer valid only while supplies last. The Arch Kit is perfect for venues with low ceilings or even your home with a total height of 8.25ft. Get a professional look in minutes with this affordable solution designed for DJs, bands, or any entertainer on the go. Includes all parts to mix and match truss size setup depending on venue size, up to 23' wide! The CedarsLink Black Metal Arch Kit is a lightweight triangular truss system providing the perfect location to hang lights and other DJ equipment for a professional presentation.